SGT John R. O'Donnell, Jr. Date of Death: March 29, 2013. Unit: Marine Helicopter Training Squadron 302 (HMHT-302) “Phoenix”, MCAS New River, North Carolina. John R. 'Jake' O'Donnell, Jr. resided in Bayonne until his graduation from Saint Peter's Preparatory School (Class of 2004), Jersey City, New Jersey. He then joined the United States Marine Corps on December 27, 2004. At boot camp graduation at Parris Island, South Carolina he was promoted meritoriously to PFC Jake proudly served his country with one tour of duty in West PAC, one tour of duty in Iraq, and two tours of duty in Afghanistan. He was promoted to LCpl in 2006 while stationed at MCAS Beaufort, South Carolina and then Promoted to Sgt in 2009 while serving at MCAS Kanehoe Bay, Hawaii. He was a car enthusiast, and was a member of the American Car Club, Team TOS. Jake was married to his sweetheart, Kristen Pollard. He was the devoted son of John and Kathleen O’Donnell of Bayonne, New Jersey and brother to Kelsey, Shannon, Tara, Meghan and Liam. He spent 3 years with the Marine Heavy Helicopter Squadron 362, stationed at Marine Corps Base Kanehoe Bay, Hawaii. 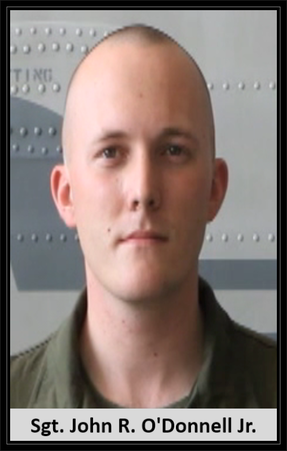 His last squadron was Marine Helicopter Training Squadron 302 (HMHT-302) “Phoenix” based in MCAS New River, North Carolina. Jake and his wife had just purchased their first home in Jacksonville, North Carolina when we lost him.